Many people grind or clench their teeth without realizing. Grinding of the teeth (also known as bruxism) can cause irreversible damage to teeth, gums, fillings, crowns, and jaw. If you wake up with a sore jaw and headaches or notice gum recession or teeth sensitivity, a night guard may be able to help resolve your symptoms. A night guard is a comfortable custom made removable appliance that fits over your upper OR lower teeth. It is generally soft on the inside and slightly harder on the outside preventing the damage that occurs when teeth grind against each other. If you have many fillings and crowns in your mouth, a night guard may also protect the longevity of your fillings and crowns by preventing them from breaking when you grind or clench your teeth. A night guard is very easy to make and comes in clear, pink, blue or green. 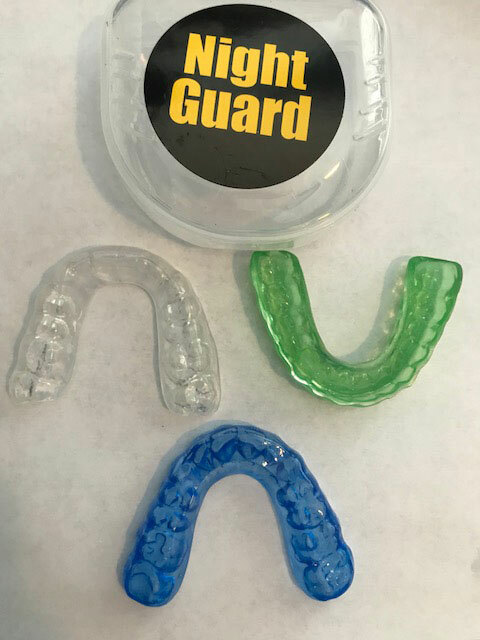 Schedule an appointment today to get fitted for a custom night guard!